☆☆☆☆ “Black Summer is The Walking Dead without all the bloated melodrama, kooky villains, and pretentious blabbering (and, unfortunately, quality makeup and effects). That makes it less of an actual TV show and more of a sensory experience. I don’t know if that means it’s good, but it’s an easy and effective watch for fans of the genre who just want to see how f—ed up a zombie apocalypse can be, and if it draws an audience that doesn’t mind that formula, it could go on for 25 seasons.” — TV Guide. ☆☆☆☆ “Fans of Z Nation will rejoice at the arrival of this zombie drama prequel, developed by the show’s co-creator Karl Schaefer and John Hyams. A group of American refugees band together for survival in a post-apocalyptic world. Jump scares galore, but the gory story’s core is an anguished mother seeking to reunite with her lost daughter.” — The Guardian. ☆☆☆☆ “Unlike The Walking Dead, there are no sweeping romances or heartfelt moments of unlikely friendship to be found in Black Summer to give you episodes of light amongst the darkness. And I use the word ‘darkness’ here both figuratively and literally, as not only is the show emotionally bleak, it’s also shot in a way that will make you believe the lighting guys just took the whole week off. So don’t panic that your TV is on the fritz, the show really is that gloomy.” — MamaMia. 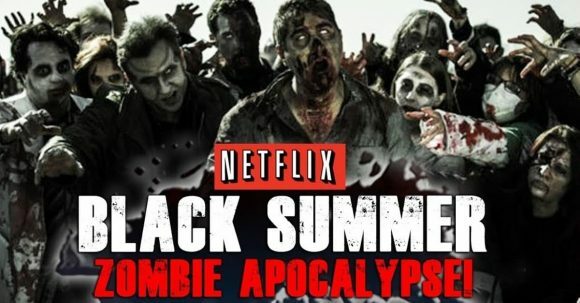 ☆☆☆☆ “Nothing is less terrifying than over-familiarity, and that’s only one of the many problems with Netflix’s Black Summer, a bleak, dull affair that mistakes camera movement for narrative energy and has about as much life as the walking dead … While The Walking Dead got way too talky over the years, this is the other extreme.” — RogerEbert.com. ☆☆☆☆ “The series consists of eight episodes and explores the choices we make in the most challenging of circumstances and what someone would do in order to survive. Creators Karl Schaefer and John Hyam, who wrote the pilot episode, provide an interesting and exciting series that grips you in the opening minutes. The episodes are fast-paced but let each character shine with their own story within the complex narrative.” — Ryno’s TV.